The crazy motorcycle has little regard to ergonomics or practicality. 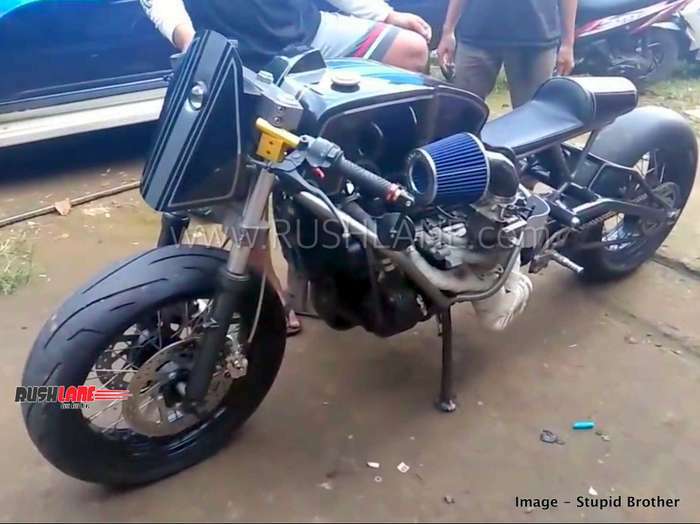 Just when we thought we have come across every wackiest possible two wheeler mod, folks at Bokor Customs from Indonesia have decided to push the envelop way further. What you see here is a hand-built cafe racer that makes pretty much every other custom motorcycle feel mainstream. It is not about how it looks but it is about what it carries for an engine. For some unfathomable reasons, somebody thought it would be fun to take a 7-seat MPV’s engine and build a homegrown two-wheeler around it. Taken from the Toyota Innova, the 2.0-liter petrol engine may fall short of Triumph Rocket III’s majestic 2.3-liter unit in terms of sheer displacement but given that it was engineered with the roomy engine bay of a family hauler in mind, it simply looks colossal on-board the tubular frame. We can’t help but wonder if the tubular chassis has what it takes to hold the hefty engine and its 6-speed automatic transmission without failing abruptly one day. Just like in the MPV, the custom builders have mounted the engine and transmission longitudinally but decided to use chain drive for final transmission. We are not sure how much of the engine’s 136 PS and 183 Nm of torque are usable at this contraption’s slick-tyre-shod rear wheel. The start up seems like a ritual in itself but once cranked up, the engine bursts into life with a menacing note, thanks to the performance air-filter and lack of an exhaust system. As if the powertrain is not heavy enough, the motorcycle also carries a pair of large batteries to keep things running. While this custom motorcycle is definitely audacious and unique in its approach, it is also utterly pointless, impractical, and unsafe. We hope it spends most of its lifetime stationary as an interesting showpiece rather than endanger road users simply by being on the move.